Description: OpenSS7 Hardware Selection A101/102/104c. The A101/102/104c cards are 1-, 2- and 4-span E1, T1 or J1 cards manufactured by Sangoma. The figure below shows a picture of an A101c card. The A10Xc cards have an increased level of signalling performance due to availability of on-board HDLC processing. Transfers to the host are performed using bus-mastering PCI DMA burst transfers for lower host processor overhead. 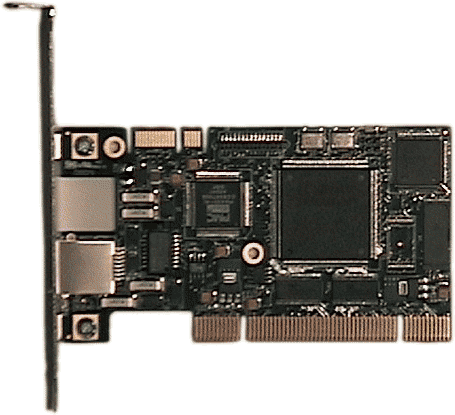 These cards do not support direct on-board TDM switching; neither do they have integrated Ethernet. These cards are supported by the A100 driver. The function of the A100 Channel driver is to provide for the termination of 2.048Mbps, 1.544Mbps, 64kbps and 56kbps digital paths. This driver provides direct access to the channelized or unchannelized T1 or E1 digital paths to OpenSS7 media and signalling protocol modules as well as providing T1 or E1 management, framing, coding, alarms, and synchronization. 1, 2 or 4 E1 spans per card. Can use OpenSS7 Soft-HDLC engines for SS7, ISDN and ISO. Also provides for onboard HLDC (SS7 DAEDR/DAEDT AERM/SUERM). 24, 48 and 96 channels per card (T1 A101, A102 and A104). 31, 62 and 124 channels per card (E1 A101, A102 and A104). Supports a wide range of Open Source drivers. The performance limiting factor of the A101c, A102c and A104c cards is the bandwidth of the PCI bus and the ability of the processor to perform TDM switching is software. For the OpenSS7 VoIP Switch, this performance is more than adequate, particularly as TDM switching is not a requirement for this pure signalling application. Although these cards lack integrated Ethernet support, for the non-redundant switching application, and where interworking between SIGTRAN and SS7 is not required, this is not a limitation. These cards have excellent price-performance and can provide 64kbps SS7 links at average incremental interface cost of approximately $12.00 USD per signalling link.